A really sad week on the reading front. Busy week and busy weekend, hopefully next week is a little quieter! A meme hosted by Kathryn at The Book Date. Sometimes when we are busy reading has to take a back seat. Better luck this week for a few quiet moments! These are all new to me. I hope you are enjoying them all. Come see what I have been reading here. Happy reading! 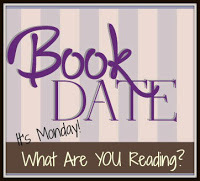 Hope this week is better for you on the reading front!